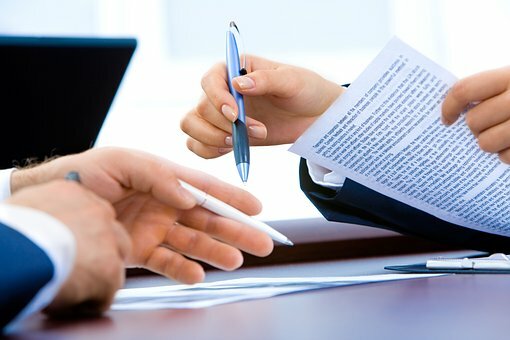 The LinkedIn platform acts as a source of unique information and gives beneficial insights into the dynamics facing employees and job seekers, from those seeking to learn new skills to those shifting to new roles. The platform boasts of more than 500 million members. In the U.S. alone, LinkedIn has more than 150 million members. Therefore, it can provide valuable trends about the American workforce. According to the August 2018 report by the employment-oriented service, data science skills are rising in demand across industries in the U.S. In fact, the high demand has resulted in a countrywide shortage of 151,717 professionals with data science skills. Data science involves making value of available data using various scientific tools and processes. Scientific methods, formulae, and algorithms are usually applied to gain comprehensive insights and extract useful patterns from both structured and unstructured data. Previously, the data science field was not considered as lucrative and there was a surplus of data scientists. For example, in 2015, a U.S. employer who wanted to hire a data scientist did not have to struggle looking for someone with the skills. Local shortages were fewer and employers had plenty of options to select from when hiring candidates. However today, three years later, the situation is no longer the same: data science skills are in short supply in nearly every large city in the U.S. In fact, the shortage is said to be so widespread that it is not limited to the tech and finance fields. Indeed.com, the employment-related search engine, estimates that data scientists in the U.S. make an average of $131,651 per year. The LinkedIn Workforce Report spells that data analysts and scientists, in the next five years, will be among the most sought-after professionals. This has been confirmed by IBM and the World Economic Forum forecasts which put the yearly demand for roles relating to data development, data science, and data engineering to reach almost 700,000 openings by 2020. 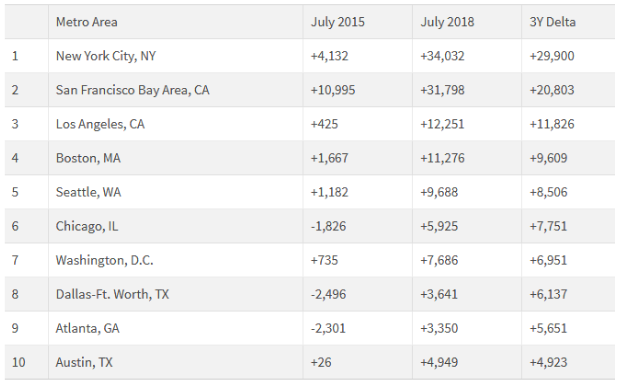 Here is a table that shows the intensification of lack of data science skills across some major U.S. cities, from July 2015 to July 2018. Skills shortage is marked with a plus sign (+) while surplus is marked with a minus sign (-). Comparing the summer hiring in July 2018 to the previous year, the 2018 hiring was stronger with the total figure of gross hires rising by 4.6% nationally, in all industries. National hiring adjusted seasonally also rose by 0.5% between June and July 2018. Agriculture, manufacturing, and transport & logistics were earmarked as the industries that experienced the most significant year-over-year hiring leap in June at 26% higher, 12.3% higher, and 12% higher respectively. The skills gap in the data science field is real. Only three years ago, there was a surplus of data science skills in the entire country and employers had an array of professionals to select from with little to no shortages. The situation is much different today, with an acute shortage being experienced around the country. For instance, New York City is experiencing a dire shortage of 34,032 data scientists, with Los Angeles seeking about 12,251 people skilled in data science, and the San Francisco Bay Area facing a shortage of an estimated 31,798 people. Migration is rampant as people are moving to stronger job markets like Austin TX, which was ranked top in the U.S. Hiring in the city rose by 14.3% compared to last year through attracting more workers. LinkedIn has since established that out of their 10,000 members in Austin currently, 105 migrated to the city in the last 12 months. Out of these, 10.5% moved from Houston, 7.6% migrated from San Francisco, and 4.8% are from New York City. The significant migration to Austin can be attributed to the flourishing tech hub that it flaunts, exhibited by the huge skills gap in data storage technologies and the dire need for development tools. The August 2018 LinkedIn Workforce Report goes a long way in helping workers steer their careers the best way possible given the insights in different fields and industries. As indicated by the report, data science is huge in all industries today and positioning yourself well can help you make the biggest career move of your life. Because of the huge skills gap in the field, you can learn data science and increase your chances of getting work. Data science is the most in demand skill for the future. So, what are your thoughts about the skills gap that exist in the data science field?